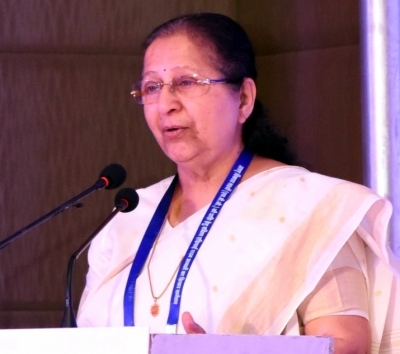 New Delhi July 12 (IANS) South Asia is one of the fastest growing sub-regions of the world but has not been able to create enough job opportunities for youth as 80 per cent workforce remains in the informal sector Lok Sabha Speaker Sumitra Mahajan has said. In her address at the plenary session of Third South Asian Speakers Summit in Colombo Mahajan said that the Sustainable Development Goals (SDGs) bear special significance for South Asia as the region is home to more than 35 per cent of the world s poor who suffer from many developmental and infrastructural gaps according to an official release here. The SDGs are a universal call to action to end poverty protect the planet and ensure that all people enjoy peace and prosperity. According to the release Mahajan said South Asia region lags behind in terms of human development and adverse effects of population pressure and over-exploitation of limited natural resources is clearly visible everywhere. Referring to initiatives by the government for implementation of SDGs Mahajan cited work done in schemes such as Ayushuman Bharat Yojana PM Bima Suraksha Yojana PM Jeevan Jyoti Bima Yojana and Pradhan Mantri Avaas Yojana. About economic empowerment of women she referred to Ujjwala Yojana Scheme and said the poor had drawn benefits from it. Mahajan also gave an account of the initiatives under the Corporate Social Responsibility (CSR) on various social welfare schemes. MP Bhubaneswar Kalita who took party in the session Role of Sustainable and Green Industrialization in the realization of the SDGs in South Asia said promotion of green energy and green technology has been integral to India s industrial development particularly since the last two decades. He said India and France have pioneered the International Solar Alliance a dedicated platform for cooperation among the solar resource rich countries. Noting that National Green Tribunal is playing a remarkable role in enforcing principles of sustainability in industry besides addressing environmental concerns Kalita said a nation-wide campaign on energy conservation has also been initiated. The participants also discussed the role of Parliaments in promoting a safe and secure working environment and their role as promoters of social and economic inclusion in South Asia. The last summit was held at India s Indore and this year s summit is carrying forward the consensus arrived in the Indore Declaration. The release also said that Mahajan met Inter-Parliamentary Union President Gabriela Cuevas Barron on the sidelines of the summit and discussed issues of mutual interest.